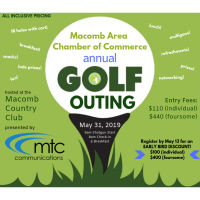 The Macomb Area Chamber of Commerce is hosting the annual Macomb Area Chamber of Commerce Golf Outing, presented by MTC Communications, on May 31, 2019 at Macomb Country Club, 20 Hickory Grove. The event kicks off with a shotgun start at 9 am. Check-in and breakfast are served at 8 am. All-inclusive pricing features18 holes of golf with cart, breakfast/lunch/snacks, mulligans, prize giveaways, networking opportunities, and more. Entry fees are $110 for an individual or $440 for a foursome. Registration received by May 13 will receive and early bird pricing of $100 per individual or $400 for a foursome. The foundation welcomes any and all Chamber businesses, organizations to participate and sponsor the event. The golf tournament is the sole fundraising activity for the Macomb Area Chamber of Commerce and is increasing in popularity every year. All proceeds will go to help the Macomb Area Chamber of Commerce in their organization’s mission to promotes the growth of the Macomb area & serves as a catalyst for the business, professional & educational community's efforts to enhance the economic climate & quality of life for all citizens. The format for the tournament is a 4-player format with morning tee off. Various hole contests and activities will be available throughout the event. More information about the tournament, including online registration and sponsorships can be found on the Macomb Area Chamber of Commerce website at www.macombareachamber.com. Follow the Macomb Area Chamber of Commerce on Facebook and Instagram. #keepitinmacomb.